MILAN (AP) -- This is the season of renewal, with new faces at some of Milan’s top fashion brands. New creative directors made their debuts Sunday during the second day of Milan Fashion Week at Salvatore Ferragamo and Dirk Bikkembergs, days after Marni and Zegna set off in a new direction. Roberto Cavalli and Brioni, meanwhile, took a runway break this season as they worked out what their future creative directions would be after parting ways with their stylists. Here are some highlights of menswear previews for next fall and winter on Sunday, the second day of Milan Fashion Week. Miuccia Prada was in search of the naive for her new collection. She found herself in the 1970s, a world of leather and corduroy, oil landscape paintings and natural amulets. So the corduroy leisure suit with big pockets, the soft cashmere sweaters with fuzzy reproductions of landscapes, the furry shoes sticking out from the cuffed bell bottom pants and the hand-knit pullovers mimicking a stain glass window are all her expressions of normality. And the collection, in its simplicity, is her protest against excess, the modern need for everything to be big. The collection also featured womenswear, including leather jackets with stud detailing, slit leather walking skirts and brimmed corduroy caps. Amulets of shells, stones or branches that Prada said she plucked from the woods herself accented the looks for both men and women. Colors stayed in a 1970s design palette of brown, tans, rust and orange, breaking out for richly hued purple and blood-red furs. Bags included hard cases or oversized document holders in cow’s skin. Missoni is bursting with color for next season’s collection, with layered looks to enliven any urban center. But if Angela Missoni had one specifically in mind, it is Tokyo -- not for its adventurous youth counterculture or traditional silhouette, but its enduring craftsmanship. Much of the detailing of the collection shown Sunday in Milan was inspired by Japan, including the star-fish shaped metallic embroidery on knitwear inspired by Shibori designs. Patchwork overcoats employed the technique of kimono making. And boxy jackets recalled Japanese workwear. Together, the urban nature of the collection cannot be denied. But taken by piece, there were many seafaring references, from thick duffel coats with robe fasteners, high-neck cable knit sweaters with matching caps, and bucket hats in the Missoni zigzag that had a sailor-geek vibe. Short scarves were tied around the neck. The hats, which also include a beret, were the result of one of Missoni’s many collaborations, this one with the Parisian milliner Larose. The modus operandi was layering without regard to conventions of pattern and color. A sweater in a blur of green and yellow is worn over a neat blue-and-white striped shirt and orange, red and purple plaid trousers. “It is for sure a sport-lux. There is, overall, a comfortable silhouette. 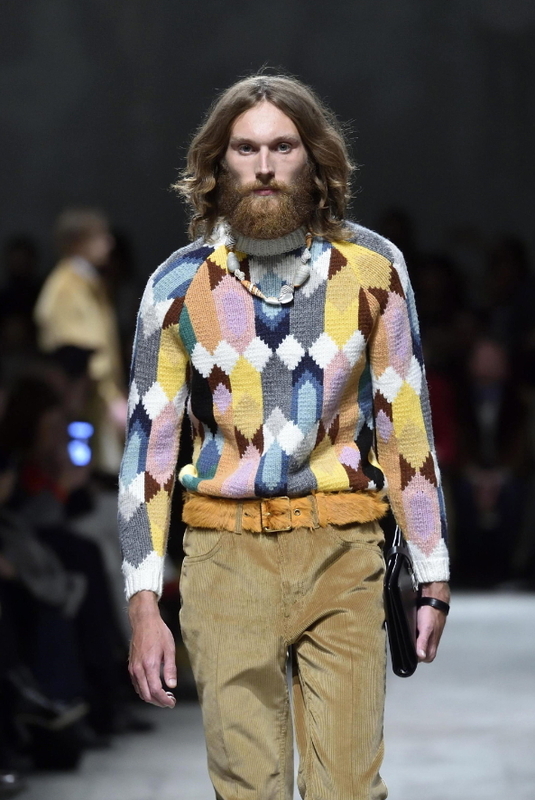 We can call it ‘soft tailoring,’” Missoni said backstage. He landed in America as a teen and thrust himself into the melting pot, where he had his first success. The story of a young Salvatore Ferragamo, who started out making shoes for Hollywood before returning to Italy to launch his fashion brand, inspired French designer Guillaume Meilland’s debut collection as menswear design director. The clean looks followed Ferragamo’s journey from a carefree youth to the more put-together sophistication of an experienced traveler. Youthful touches included rough embroidery in contrasting kinetic lines on the backs of jackets or on shirts worn with tailored suits. The silhouette was boxy with square jackets over loose pants. “The embroidery translates the busy-ness of the street. The show is about Salvatore on the street, a young man on the street, and the allegory of the busy-ness is translated in the diversity of the boy’s silhouettes,’’ Meilland said. Boyish sweaters tucked into trousers, or hung out of the back of jackets, for a dash-about feel. Bulky knit mittens exuded hominess. The collection is strong on the brand’s trademark leather garments, featuring aviator jackets and biker jackets. Shoes included an American-style work boot with thick sole covered with rubber studs, alongside finer Italian footwear. British designer Lee Wood has infused the Dirk Bikkemberg’s brand with a northern European utilitarian hipness, clothes for the urbanite on the go. The clean collection marked a new era for the Belgian brand, with sharply defined silhouettes. Suit jackets buttoned off-skew and featured big outside pockets. They were paired with slim pants when short, and baggy trousers when long. Cargo pants had a jean fit, creating a workman look when worn with a boxy jacket. Zip up turtlenecks offered extra protection against the elements under suits. Shearling jackets and parkas balanced volume with slim leggings. “A guy today, he needs to go out. He needs to get on the motorbike. He needs to go on the metro. Utilitarian is that,’’ Wood said. The thick knitwear was fashioned from merino wool, chenille and mohair. Zip pockets on elbow patches added a level of cool functionality. The color palette included reassuring tones of camel, black, white and navy with flashes of orange -- useful for the urbanite in evening traffic.